by David R. Brubaker, Ruth Hoover Zimmerman. Good Books, 2009. 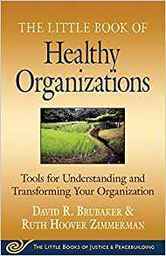 Congregations may be interested in the short and practical “Little Book of Healthy Organizations”, a modest volume with advice about organizational structure, leadership, culture and environment. While this volume is not directly addressed toward congregations, its focus is on practical ways of improvement, something all congregations need when faced with conflict or the need to change. Brubaker includes examples from a variety of organizations, including faith-based social justice organizations such as Mennonite Conciliation Service and Mennonite Central Committee, where he had previously worked. This book discusses the role of leaders, as well as factors of organizational culture that may be visible to newcomers but more difficult for long-time participants to recognize.